Above: GOES-16 visible image of Hurricane Willa at 11:15 am EDT October 22, 2018. 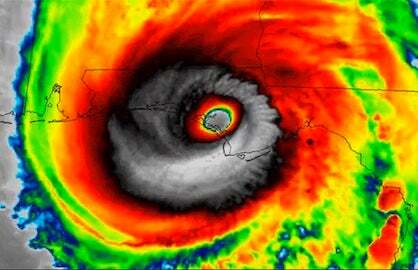 At the time, Willa was a Category 5 storm with 160 mph winds. Image credit: NOAA/RAMMB. 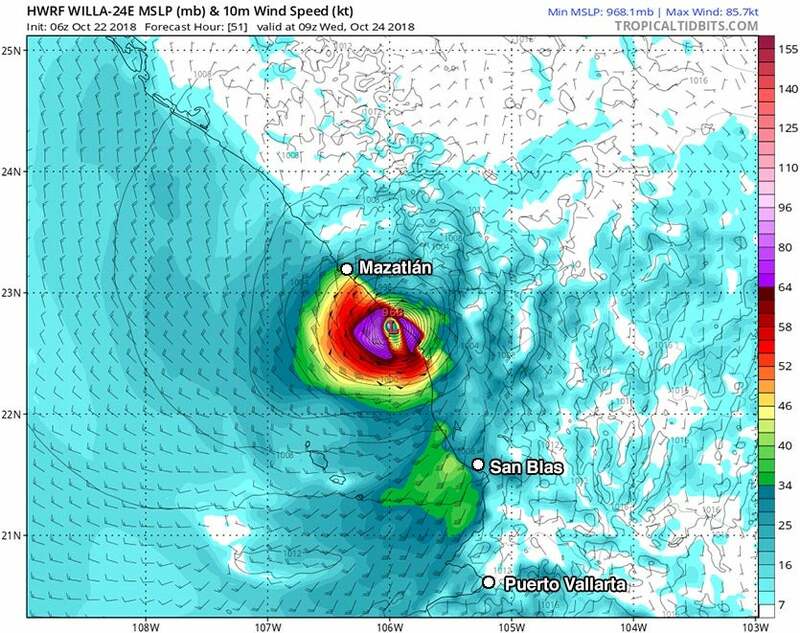 Hurricane warnings were flying for the Pacific coast of Mexico from San Blas to Mazatlán as extraordinarily fast-intensifying Hurricane Willa headed north at 7 mph towards the coast. Willa is expected to make landfall just southeast of Mazatlán (population 660,000) on Tuesday night as a major Category 3 or stronger hurricane. An Air Force hurricane hunter aircraft flew into Willa early this afternoon, but aborted the flight due to a safety issue before penetrating the eye, and has headed back to base. Like other strong hurricanes we've seen this season, #Willa has started to show abundant eyewall lightning. Satellite images early Monday afternoon showed that Willa was an extremely impressive hurricane, with a prominent eye surrounded by a ring of very intense eyewall thunderstorms with cloud tops that were as cold as –80°C (–112°F). Cloud tops this cold can only occur if the updrafts pushing them upwards are very vigorous. Willa had a favorable environment for intensification, according to the 12Z Monday analysis from the SHIPS model: moderate wind shear of 10 - 15 knots, a moist atmosphere with a mid-level relative humidity of 65%, and warm waters of 28.5°C (83°F). Willa was an average-sized hurricane, with hurricane-force winds that extended out up to 30 miles from the center, and tropical storm-force winds that extended out up to 105 miles. Figure 1. Predicted surface winds (colors) and sea level pressure (black lines) for 5 am EDT Wednesday, October 24, 2018, from the 6Z Monday run of the HWRF model. The model predicted that Willa would make landfall in Mexico as a weakening Category 2 hurricane with 100 mph winds and a 968 mb pressure. Image credit: Levi Cowan, tropicaltidbits.com. Willa is expected to move over warmer waters with a much higher heat content through Tuesday afternoon while the wind shear remains a moderate 10 – 15 knots. SSTs will rise to 29.5°C (85°F) during this period, and the heat content of the waters will rise from 19 kilojoules per square centimeter to over 50 kilojoules per square centimeter on Tuesday. This amount of heat energy is certainly capable of maintaining Willa at Category 5 strength through Tuesday afternoon. However, microwave satellite imagery on Monday morning showed the presence of concentric eyewalls inside Willa, a sign that the hurricane was about to undergo an eyewall replacement cycle (ERC). In this process, common in intense hurricanes, the inner eyewall collapses and a new eyewall with a much larger diameter forms from an outer spiral band. The storm’s peak winds typically decrease by 10 – 20 mph during an ERC, and the area of ocean affected by hurricane force winds increases, generating a larger storm surge. In the 12 hours before landfall on Tuesday, Willa will encounter higher wind shear of 15 – 20 knots, and the storm will also begin to interact with the high terrain of Mexico. These factors should lead to steady and possibly rapid weakening just before landfall. Still, landfall as a major Category 3 hurricane is quite possible, as predicted by NHC. Most of our reliable intensity models, with the exception of the HMON model, predict that Willa will be a Category 2 or weaker storm at landfall, though. Figure 2. 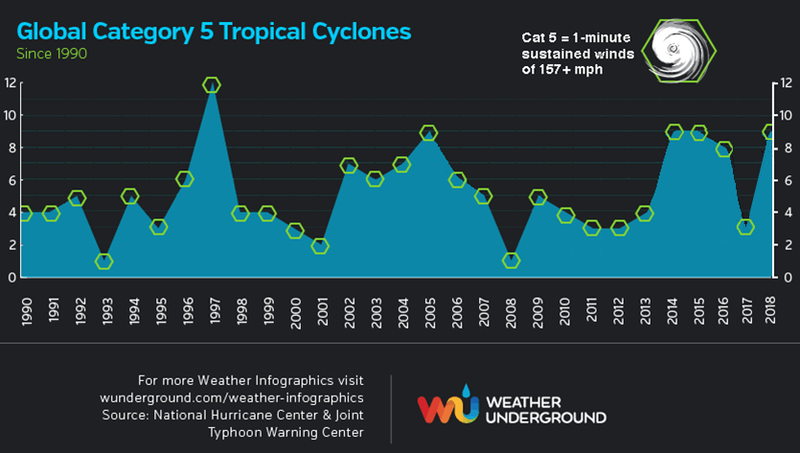 Global Category 5 tropical cyclones from 1990 - 2018, as rated by NOAA's National Hurricane Center and the U.S. Navy's Joint Typhoon Warning Center. The quality of the database rating Cat 5s is too poor and the time series of decent data on these storms is too short to make definitive conclusions about how climate change may be affecting these most powerful of storms. Climate change is expected to make the strongest storms stronger, and increase the number of Category 5 storms, so we should expect to see an increase in these mightiest of storms in the coming decades. Willa brings the 2018 tally of Category 5 storms to nine, along with Kong-rey, Walaka, Trami, Marcus, Maria, Lane, Jebi, and Mangkhut. This puts 2018 in a tie for second place for most Cat 5s in a year since accurate global satellite data began in 1990. The only year with more was 1997, with twelve. It’s possible that post-season analysis will give us more Cat 5s: Hurricane Hector in the Central Pacific just missed making Category 5 status, topping out with 155 mph winds, and Hurricane Michael in the Atlantic also topped out with 155 mph winds. Willa intensified in stunningly quick fashion: from a 35-mph tropical depression at 5 am EDT Saturday to a 160-mph Cat 5 storm at 11 am EDT Monday. This interval of 54 hours matches the record rate of intensification from tropical depression to Category 5 strength for the Atlantic, held by both Wilma (2005) and Maria (2017). 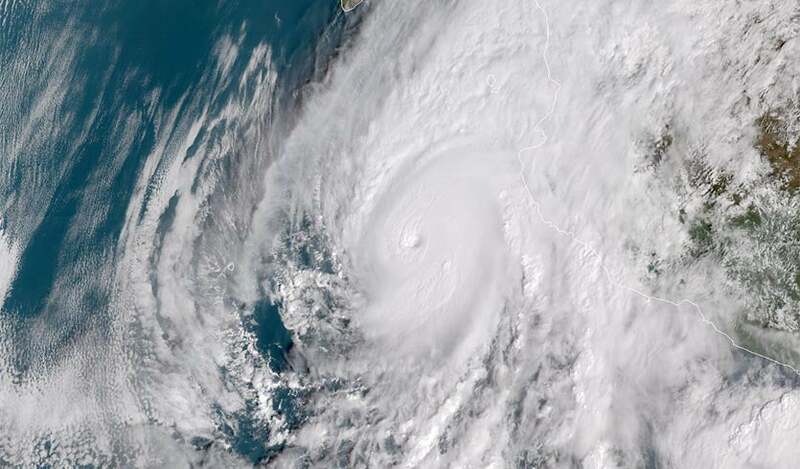 Willa’s extraordinarily rapid spin-up brings to mind Hurricane Patricia, which became the strongest hurricane ever recorded in the Western Hemisphere with 215-mph sustained winds on October 23, 2015. Just east of the region where Willa quickly intensified, Patricia strengthened from Cat 1 winds of 85 mph to Cat 5 winds of 205 mph in roughly 24 hours, the most rapid increase in winds ever observed on Earth in that short a period. Patricia was a small hurricane, which allowed for a very rapid weakening just before landfall; even so, it came ashore with Category 4 winds of 150 mph winds, making it the strongest landfalling hurricane on record in the Eastern Pacific. Second place is held by 1976's Hurricane Madeline (Mexico) and 1992's Hurricane Iniki (Kauai, Hawaii), both with 145 mph winds. Patricia’s pressure at landfall of 932 millibars was the lowest on record for any Pacific hurricane on Mexico’s coast. 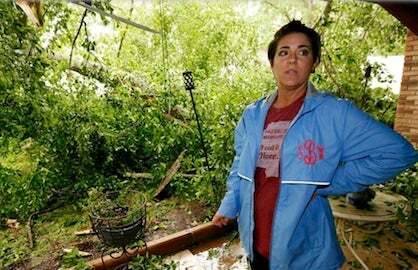 Although Patricia struck a relatively rural part of Jalisco state, it inflicted an estimated $460 million US in damage and led to at least 13 direct and indirect deaths. Patricia also served to highlight the growing risk of rapidly intensifying hurricanes close to shore, as we discussed in these 2016 and 2018 posts. Willa has taken advantage of a pocket of very warm SSTs untouched by this year’s other major hurricanes, running more than 1°C (1.8°F) above the average for this time of year. Intense hurricane landfalls on Mexico’s Pacific coast are twice as likely during El Niño (10 of the top 25) as during La Niña (5 of the top 25), according to a 2013 study led by Luis Farfán (University of La Paz). The importance of warm SSTs in this region for intense hurricanes was reinforced in a 2017 paper by Timothy Hall (NASA/GISS) and Michael Tippett (Columbia University/King Abdulaziz University). 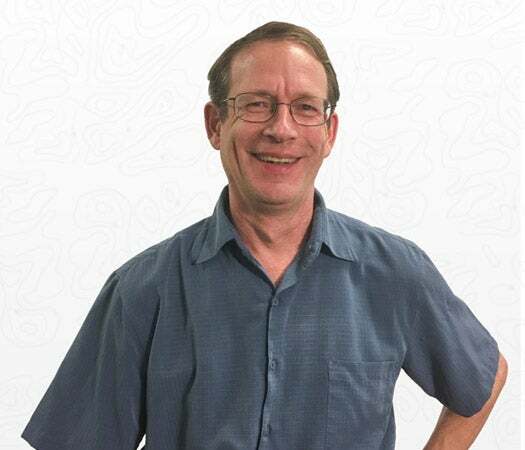 They used a model-generated extrapolation of all seasons from 1971 to 2014 to estimate the risk of Category 5 landfalls on Mexico’s Pacific coast, although no actual Cat 5 landfalls are on record there. They found that SSTs as warm as those observed in the hyperactive 2015 season lead to a statistically significant increase in the risk of a Cat 5 landfall, especially toward the northern Pacific coast of Mexico. At least 13 Eastern Pacific hurricanes have each led to at least 100 deaths. The deadliest on record is the Mexico hurricane of 1959, which struck just north of Manzanillo as a Category 4 storm on October 27. Many hundreds of homes were destroyed in and around Manzanillo, and there were at least 1000 direct and 800 indirect deaths. The deadliest hurricane to affect southern Baja California was Liza (1976), which moved near the southern tip of the peninsula before a Category 3 landfall north of Los Mochis on the Mexican mainland on October 1. 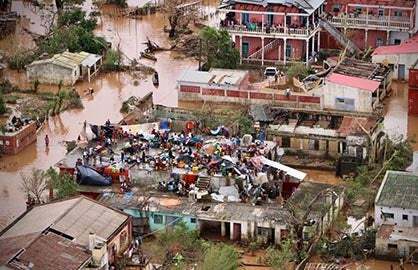 Heavy rains on the southernmost peninsula led to a dam failure that killed hundreds, part of a total death toll that exceeded 1200. Just eight Eastern Pacific hurricanes have had their names retired because of their landfall impacts in Mexico. The most expensive Pacific hurricane for Mexico was Hurricane Manuel of 2013, which did $4.4 billion in damage (2013 dollars). Figure 3. Accumulated cyclone energy (ACE) for the Northeast Pacific for each hurricane season since reliable data began in 1971. This region, sometimes called the Eastern Pacific, is defined here as the area between the International Date Line and the Americas. We have added the record-breaking current value of 302.5 units as of October 23 to the original graphic. Statistics calculated from National Hurricane Center/Central Pacific Hurricane Center best tracks as archived in the International Best Track Archive for Climate Stewardship. Image credit: Colorado State University. Willa’s fierceness will throw an additional slug of accumulated cyclone energy (ACE) onto a seasonal total that’s already the highest on record for the Eastern Pacific. Also called the Northeast Pacific, the region is defined here as the area between the International Date Line and the Americas, including the forecast region dubbed the Central Pacific. As of Monday morning, October 22, the seasonal ACE total for the Eastern Pacific was up to 302.5 units, according to data from Colorado State University. This tops the previous record in the CSU database of 295.2 units in 1992. Reliable data extends back to 1971, the start of the satellite era for that region. Mexico has another tropical cyclone to be concerned with today: Tropical Storm Vicente, with top winds of 45 mph, which was located about 100 miles south-southwest of Acapulco at 11 am Monday morning. Vicente is expected to weaken to a tropical depression and dissipate on Tuesday as it moves west-northwest and then northwest and makes landfall. Vicente (or its remnants) will bring heavy rains of 3 to 6”, with local amounts to 10”, to portions of Guerrero, Michoaca, Colima, and Jalisco in Mexico. Figure 4. Infrared satellite image of Tropical Storm Yutu as of 1530Z (11:30 am EDT) Monday, October 22, 2018. The outlines of the Mariana Islands—including Guam, the southernmost—are visible at far left. Image credit: CIRA/SSEC/UW-Madison. Tropical Storm Yutu: Yet another Category 5 monster in the works? Next up in the queue for rapid intensification is Tropical Storm Yutu, located in the open Northwest Pacific about 600 miles east-southeast of Guam. Yutu is off to a running start, embedded in a very moist atmosphere atop extremely warm SSTs of 30-31°F (86-88°F). SSTs will drop only slightly over the next several days, and wind shear should remain below 15 knots. The 06Z run of the high-resolution HWRF model brings Yutu to Category 5 strength by this Friday local time and sustains it there into the weekend. The European and GFS global models also show a very supportive environment for strengthening as Yutu tracks west-northwest through the Marianas Islands and beyond, driven by well-established steering currents. The latest Joint Typhoon Warning Center forecast, issued on Monday morning, takes Yutu just north of Saipan and Guam as a Category 3 storm on Thursday local time. Such a track would spare these islands from the storm’s worst impacts, although Saipan in particular should keep a close eye on this storm. Yutu's future beyond the weekend is highly uncertain.